After the big success at 50th Bitef – the special jury prize and the audience prize – the French director Joris Lacoste is at our festival again, and what is more, at its very grand opening. What comes after Suite N° 2 is, logically, Suite N° 3, which bears an additional description – Europe. This addition precisely defines the topic of this truly original music performance: an overview of the situation in all the EU member states when it comes to their respect of the "European values". Like previous Joris Lacoste’s projects in this series, Suite N° 3: ‘Europe’ is based on his research project Encyclopédie de la parole, an on-line archive of endless and very varied audio recordings which range from political speeches to random street conversations. The composition of this suite is quite simple, strict and transparent, almost classicist even. On the stage, there is only a concert piano, a pianist and two singers who perform a basically static music recital consisting of 28 scores. Yet it slowly becomes choreographically more complex, more developed, and more estranged. 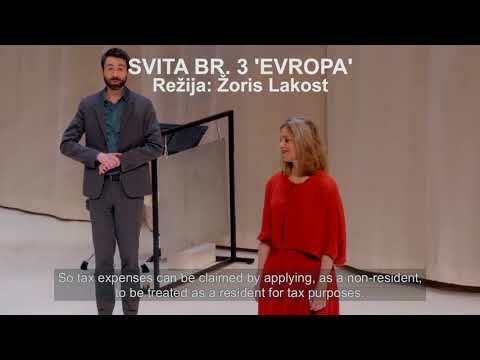 Each score is reduced to one audio recording from each of the member states, it is sung in the state’s official language, while thematically focusing – regardless of whether it is a speech in the parliament or an amateur YouTube recording – on some of the grave dangers the European project is facing today: right-wing populism, xenophobia, intolerance to Jews and refugees from Muslim countries, authoritarian regimes, capitalism in its rawest form… Utterly witty, stripped of any moralization, pathetic quality or ideological instruction, Suite N° 3: ‘Europe’ is a smart, rational, and refined diagnosis of European societies taking the right turn and, as such, it defines the 52nd Bitef theme right from the start. In 2013, the Encyclopédie de la parole initiated a cycle of four “Choral Suites” all based on the same principle: the live reproduction of audio-documents taken from the Encyclopédie de la parole's collection. As with Suite N°1 and Suite N° 2, these speeches are faithfully reenacted by two performers in order to render their oral dimension and all their melodic, rhythmic, intensive and timbral nuances. Re-enacting them is a way to make their reality audible whilst transposing them into the fictional setting of a theatre. Condescending sermons, safety instructions, embarrassing claims, verbal abuse, monologues of solitude, police brutality, hate speeches, pro-conspiracy rambles, standardized job interviews, personal-development coaching, public humiliation, adolescent moaning... In our daily lives, we are overwhelmed by utterances, that embarrass us, disgust us, bother us, make us angry, depress us, shock us, annoy us, or make us feel sorry for their issuers. What do we do with them? What strategies do we adopt to keep them at a distance? Can music allow us to neutralise them, to laugh at them, to momentarily ward off their violence or to shift and deepen the way we consider them? Can art free us from the influence and the venom of forked tongues? JORIS LACOSTE has been writing for theater and radio since 1996 and has been producing his own shows since 2003. He created 9 lyriques pour actrice et caisse claire in 2005 with Stéphanie Béghain and Purgatoire at the Théâtre National de la Colline in 2007. From 2007 to 2009, he was co-director of Les Laboratoires d'Aubervilliers. Taking his inspiration from literature, theater, dance, visual arts, music, sound poetry, his work is always deeply researched. In 2009 he launched the project “Hypnographie” to explore artistic uses of hypnosis: he produced the radio play Au Musée du sommeil (2009), the exhibition-performance Le Cabinet d'hypnose (2010), the exhibition 12 prepared dreams (GB Agency Paris 2012), the play Le vrai spectacle (2011) and the performance art pieces Restitution (2010), La maison vide (2012), and 4 prepared dreams (for April March, Jonathan Caouette, Tony Conrad and Annie Dorsen) in New York in October 2012. He started two collective projects, le projet W in 2004, and L’Encyclopédie de la Parole in 2007 with which he has created the shows Parlement (2009), Suite No1 (2013), Suite No2 (2015) and Suite n°3 ‘Europe’ (2017). PIERRE-YVES MACÉ’s music stands at the nexus of contemporary classical, electroacoustic composition and sound art. Born in 1980, France, Pierre-Yves Macé studied music (piano, classical percussion), eventually turning to self-taught composition. His first recording, Faux-Jumeaux, was released on Tzadik, John Zorn’s label, in 2002. It was followed by several records on Sub Rosa, Orkhêstra and Brocoli. His music has been performed by ensemble l’Instant Donné, pianist Denis Chouillet, British soprano singer Natalie Raybould, reed player Sylvain Kassap, and Amôn string quartet. Macé has been invited and/or commissioned new pieces by the Festival d’Automne à Paris (monographic concert in 2012, at the Théâtre des Bouffes du Nord in Paris), Villette Sonique (Paris), Ars Musica (Bruxelles), Les Musiques, MIMI (Marseille), AngelicA (Bologna), Santarcangelo (Rimini), Akousma (Montreal)... As a performer, he opened for Matmos, Richard Chartier, Andrew Bird, among others. He has collaborated with writers/directors Christophe Fiat, Joris Lacoste, dancers Anne Collod, Fabrice Ramalingom. He won the 2014 “hors les murs” grant (French Institute) for the Contreflux project, which involved a one-month residency in the US. As an accomplished scholar of musicology (University of Paris VIII), he is the author of the book Musique et document sonore (“Music and Sonic Documents”). Magnificent performers Bianca Iannuzzi and Laurent Deleuil are accompanied by the pianist Denis Chouillet in syncopated rhythm. Sheet music for the texts, selected and shaped by Joris Lacoste, was written by Pierre-Yves Macé. In this often surprising and extremely diverse play, sensual enjoyment softens the blow of the words clustered into registers which range from base populism, through the scenes of gaping banality or funny moments, to the worst possible filth. These speech acts really have taken place - they have been recorded and transcribed, and then learned by the performers who enunciate them in the original languages in which they were uttered. The live reenactment of speeches collected throughout Europe is accompanied by piano. This recital (intended not only for listening but also for watching) ranges from political speech, the shouts by a sport coach, to a solitary YouTube confession. The play is bewildering and educational, due to the artists’ ability to draw the entire emptiness and the quintessence of poetry out of words. Although in itself provocative and entertaining, this repetitive speech assumes full power and glory due to the melody of all the original languages whose rhythm is enhanced by the piano, which, without any emphasis, brings the sheet music to the boil. The global success lies in the music cadence by Pierre-Yves Macé, which is adapted to each language’s rhythm, letting the two performers move from a prosaic story into a unique contemporary recital and song. Both performers are magnificent singers, capable of performing “bits” of performances in 22 official European languages. collective "Encyclopédie de la parole"